Two Hawke’s Bay centenarians – both fit and well – celebrate their 101st birthdays this week. 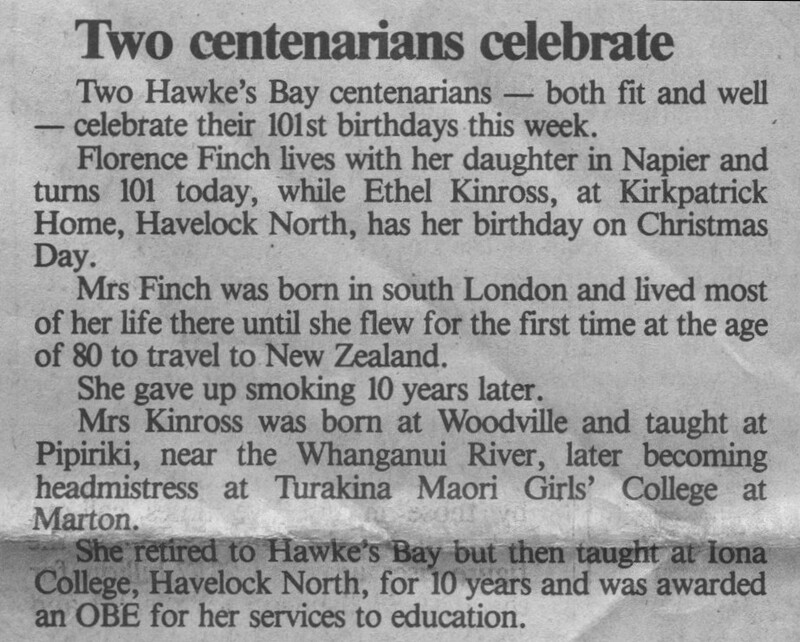 Florence Finch lives with her daughter in Napier and turns 101 today, while Ethel Kinross, at Kirkpatrick Home, Havelock North, has her birthday on Christmas Day. Mrs Finch was born in south London and lived most of her life there until she ﬂew for the first time at the age of 80 to travel to New Zealand. She gave up smoking 10 years later. Miss Kinross was born at Woodville and taught at Pipiriki, near the Whanganui River, later becoming headmistress at Turakina Maori Girls’ College at Marton. She retired to Hawke’s Bay but then taught at Iona College, Havelock North, for 10 years and was awarded an OBE for her services to education.